There are 34 Assisted Living Facilities in the Lehi area, with 4 in Lehi and 30 nearby. The average cost of assisted living in Lehi is $2,900 per month. This is lower than the national median of $3,346. Cheaper nearby regions include American Fork with an average starting cost of $2,595. To help you with your search, browse the 218 reviews below for assisted living facilities in Lehi. On average, consumers rate assisted living in Lehi 4.3 out of 5 stars. Better rated regions include American Fork with an average rating of 4.3 out of 5 stars. Caring.com has helped thousands of families find high-quality senior care. To speak with one of our Family Advisors about assisted living options and costs in Lehi, call (855) 863-8283. Lehi, Utah is situated at the head of Utah Lake, just south of Salt Lake City. It's known for its sprawling mountain views and Thanksgiving Point, a nonprofit complex made up of museums and gardens. Of Lehi's residents, 5.5 percent are seniors over 65 years of age. There are four assisted living facilities in Lehi and an additional 47 in nearby areas such as Cedar Hills and American Fork. The Utah Bureau of Health Facility Licensing, Certification and Resident Assessment is responsible for regulating assisted living facilities throughout Utah. Although Lehi's overall cost of living is 11.8 percent higher than the U.S. national average, individual costs such as groceries and transportation are actually below average, meaning seniors living in Lehi may be able to save extra money or use it toward the cost of assisted living. Lehi's winters are cold and extremely snowy. The city receives an average of 40 inches of snow each year and has an average January low of 19.4 degrees. Seniors who prefer warmer weather will probably want to look at assisted living elsewhere. Seniors living in Lehi can feel safe. With ultra-low crime rates, Lehi is safer than 52 percent of cities in the U.S. The murder rate in the city is zero and only 12.56 property crimes occur per 1,000 residents each year, which is less than half the state average of 29.52 per 1,000 residents. Lehi has an array of community resources for seniors, including city-funded lunch programs and day trips, as well as one senior center. The Lehi area is home to world-class medical facilities, including Mountain Point Medical Center, in case of medical emergencies or illness. Utah is only partially tax-friendly. A flat 5 percent tax rate is charged on all income, including retirement income, however, seniors can claim a small credit on taxes paid. Assisted Living costs in Lehi start around $2,900 per month on average, while the nationwide average cost of assisted living is $4,000 per month, according to the latest figures from Genworth’s Cost of Care Survey. It’s important to note that assisted living rates in Lehi and the surrounding suburbs can vary widely based on factors such as location, the level of care needed, apartment size and the types of amenities offered at each community. 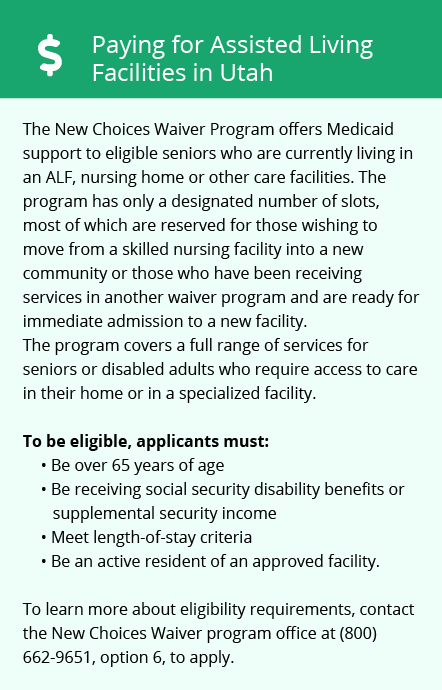 Seniors in assisted living facilities (ALFs) can apply for support under the Medicaid New Choices 1915(c) waiver program, which pays for services received in ALFs. 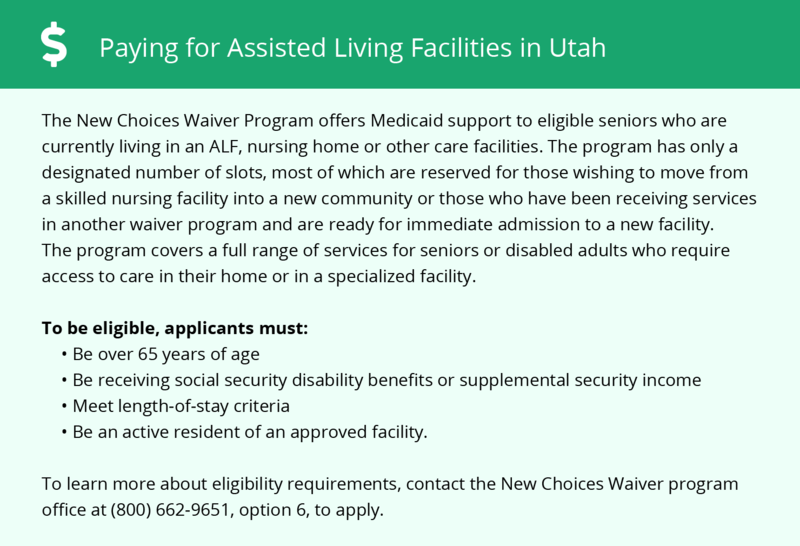 ALF residents in Utah do not receive Supplemental Security Income and are responsible for paying their own room and board costs, however, family supplementation is permitted. Lehi and the surrounding area are home to numerous government agencies and non-profit organizations offering help for seniors searching for or currently residing in an assisted living community. These organizations can also provide assistance in a number of other eldercare services such as geriatric care management, elder law advice, estate planning, finding home care and health and wellness programs. To see a list of free assisted living resources in Lehi, please visit our Assisted Living in Utah page. Lehi-area assisted living communities must adhere to the comprehensive set of state laws and regulations that all assisted living communities in Utah are required to follow. Visit our Assisted Living in Utah page for more information about these laws.